GoFishBC is a complete resource for freshwater fishing in British Columbia, providing information, guides and tips for both new and experienced anglers. It was created by the Freshwater Fisheries Society of BC (FFSBC), a non-profit organization who works with the provincial government to stock lakes and streams as well as provide fish conservation culture services that support steelhead and sturgeon recovery programs. The website provides information on lake stocking history, depth charts and detailed facts about individual bodies of water. 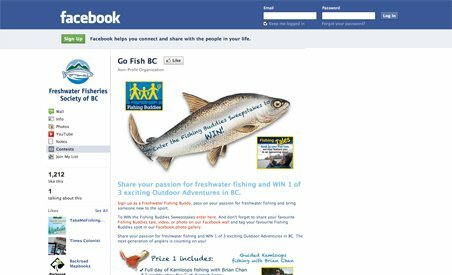 GoFishBC is a complete resource for freshwater fishing in British Columbia, providing information, guides and tips for both new and experienced anglers. It was created by the Freshwater Fisheries Society of BC (FFSBC), a non-profit organization who works with the provincial government to stock lakes and streams as well as provide fish conservation culture services that support steelhead and sturgeon recovery programs. The website provides information on lake stocking history, depth charts and detailed facts about individual bodies of water. The FFSBC is working behind the scenes to make British Columbia the premiere freshwater fishing destination in North America.